Seeking to gain a competitive edge in sports, 6th through 12th grade students are attracted to heavily marketed sports and energy drinks. Unfortunately, there is confusion about the difference between the two products, which can lead to potential health risks, especially to children. Before diving into this dilemma, understand that water is the most effective means to replace a body’s lost fluids. 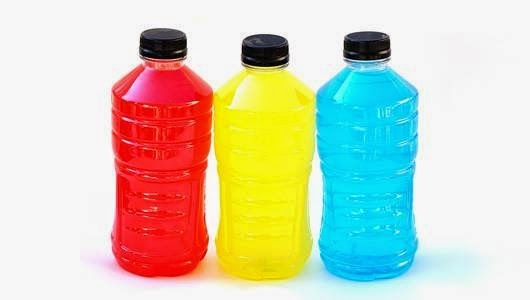 Sports drinks that are high in carbohydrates help replenish the body's depleted stores after prolonged exercise (60 minutes or more). Sports drinks help maintain the body's electrolyte balance and provide carbohydrates for additional energy. On the other hand, energy drinks contain stimulants in various combinations, such as caffeine and guarana (an herb containing caffeine). Labels can be confusing to read, and a single bottle may contain two to three servings of the drink with total caffeine content exceeding 400 to 500 milligrams per can or bottle. This substantial amount of caffeine is too much for anybody, particularly a child. By comparison, the average cup of coffee contains about 150 milligrams of caffeine while a cup of cocoa contains about 15 milligrams of caffeine per 8-ounce cup. Adverse effects associated with caffeine consumption in amounts of 400 milligrams or more include nervousness, irritability, sleeplessness, increased urination, abnormal heart rhythms (arrhythmia), decreased bone levels, and upset stomach. The caffeine contributed by energy drinks can cause a number of harmful health effects in children, including effects on the developing neurologic and cardiovascular systems. According to the American Association of Poison Control Centers, poison centers received 2,810 reports of exposures to energy drinks in 2014. More than 1,600 were children age 18 and younger. The American Academy of Pediatrics recommends that children and adolescents do not consume energy drinks. Also, the American Medical Association supports banning the marketing of energy drinks to children under 18. Want a competitive edge? Eat healthy, stay hydrated, and get enough sleep. The bottom line is to avoid energy drinks as they pose potential health risks for children and teenagers.